Walking into rooms has changed my life a few times. The first time was as an exchange student in Iceland where I attended a home ec school. When I walked into a room full of looms I knew that weaving was something that I must do, but never could I have imagined that weaving would become my life’s work. It wasn’t until I moved to Boulder that I really learned to weave from Deborah Chandler (of Learning to Weave fame) at The Weaving Shop. It was there one day when I walked into a room and met Barry Schacht, founder of Schacht Spindle Company. He asked me on a date right then and there…and the rest is history, as they say. Schacht Spindle Company in Boulder, CO. It was through Barry and Deborah that I met Linda Ligon, founder of Interweave Press. I had been working with youth in a few different government programs whose funding was ending. In considering what to do next, I decided that I really wanted to devote my life to my passion. Deborah suggested that I check in with Linda about a shipping job at Interweave. I never did that job but I did become Linda’s personal assistant and started bit by bit working in editorial. As it happened, I had a knack for this kind of work and after a couple of years I became editor of Handwoven magazine, as well as editing books and Design Collections. I really learned about weaving and weavers (and to a lesser degree spinning, through some small tasks I did for the SOAR retreat and Spin-Off magazine) during the years I worked at Interweave. I was incredibly lucky to enter this field of so many talented people who enthusiastically shared their knowledge with the readers of Handwoven. A big bonus of my work with the magazine, were the weavers I met, the trends I saw, and the creative community that I felt a part of and wanted to nurture. 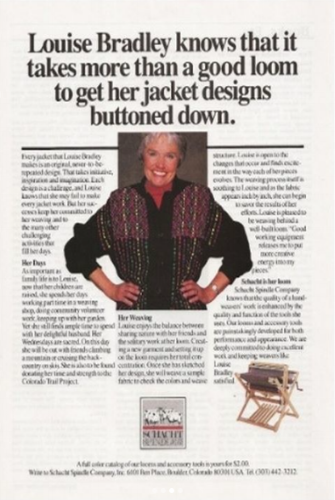 Ad campaign in the 80’s featuring weavers and Schacht's popular Baby Wolf loom. I started at Interweave in 1981, long before email and the internet. Communication was through letters and phone calls, or meeting people who flocked to conferences. As editor, I felt it was my role to try to inspire and bring people together through the articles I published, my editorials, and the tone of the magazine. Handwoven brought weaving patterns to weavers. Prior to that, the weaving movement looked similar to the modern weaving of today. Incredibly creative people were taking to weaving as a medium of artistic expression. Though the colors were different than today, the hangings looked very similar to ones being woven today. Schacht's new small frame loom, the Lilli Loom. From those early wall hanging beginnings, many weavers eventually gravitated to floor loom weaving. It offered speed, pattern development, finer yarns, and a different creative expression. A movement was afoot as I started at Interweave. Women who had been staying home and finding creative outlet in weaving were entering the labor force. Having less time to devote to their weaving changed how they engaged with it. Because weavers had less time, they didn’t want to sample and figure things out as much as have a ready-to-go project they could weave with confidence. Schacht Baby Wolf Floor Loom. Weaving during this time pretty much focused on floor loom weaving. Then about 10 years ago, I felt that it was time to start promoting the rigid heddle loom as a way to introduce weaving to new weavers. We redesigned our rigid heddle looms to create the Flip Loom and then the Cricket Loom. Both of which have been successful and expanded weaving’s reach. To support rigid heddle weaving, I authored The Weaver’s Idea book and then co-authored Woven Scarves and Simple Woven Garments. Now weaving is trending towards creative expression on simple frame looms—and finding enthusiastic devotees. And this is what I find exciting about what is happening in weaving today. I’m terribly curious about how these new weavers will evolve. Will they continue to develop their wall hangings? Or, will they splinter off into traditional tapestry weaving? Will they discover that pattern weaving is their passion? My true hope is that this new crop of weavers will be a part of the caring and sharing community that I’ve felt a part of for nearly 40 years. Sarah of The Weaving Kind and I both share a passion about creating true, authentic community. I love that she is partnering with the Makerie to bring new weavers together, to get to know each other, to learn together, to draw the circle wider. Jane Patrick is Creative Director of Schacht Spindle Company located in Boulder, Colorado. She loves to teach rigid heddle weaving and has authored several books, videos, and is a teacher on Craftsy. Weaving is Jane’s place in the world. As part of Schacht’s partnership with The Weaving Kind/Makerie, Schacht will provide a variety of looms for attendees to explore during the retreat. Conference attendees can also take factory tours prior to the conference.